I received an Outlook meeting invite in my email recently but because I use Thunderbird as my email reader I received the raw vCalendar data rather than a nicely formatted email with details of the meeting. After a quick google search I found a post on Daniel Tome's blog regarding Viewing Calendar Events in Mozilla Thunderbird. His suggestion was to install a Thunderbird add-on called Lightning. This adds a calendar into Thunderbird and also adds support for understanding vCalendar events. More information can be found at Lightning's home page. I installed the add-on and restarted Thunderbird and now the raw vCalendar email was transformed into a nicely formatted meeting invite - you even get the option to accept or decline the meeting. Just remember to right-click on the green "Install Now" button to download the add-on otherwise you will install it into firefox. UPDATE: I have an improved version of the script available here. I'm not going to repeat the many, many websites taking (and complaining) about Microsoft's proprietary e-mail attachment format called TNEF. I'm assuming that if you are reading this then you have found that these fixes are not working for you (or not possible to enforce). I'll also assume that the LookOut Thunderbird Add-on by Aron Rubin is also not working correctly for you (this was my experience on Ubuntu Edgy Eft). 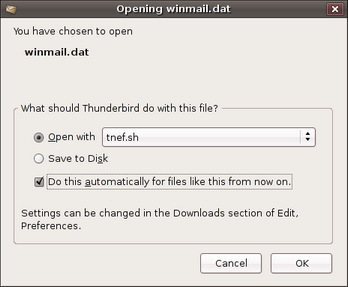 The best solution I could come up with was getting Thunderbird to run a script to unpack the winmail.dat extension into a folder on your Ubuntu desktop. Below is my little script, save it in a file called 'tnef.sh' somewhere and make sure it's executable (chmod +x tnef.sh) - or just download it here. Look on your desktop - there should be a 'winmail.dat' directory with the full contents of the attachment. Double-clicking on any future winmail.dat file will result in the contents of the attachment to also be added to that directory. Why do Rails Migrations cause the database schema to be dumped into schema.rb? Have you ever wondered why rake db:migrate took so long to complete when you ran a simple migration script? The reason is that it's dumping your database's entire schema into db/schema.rb just like rake db:schema:dump does. I had to get to the bottom of why this was happening and searching the internet was not providing any answers, so I took to searching the Rails codebase to see if I could find any clues. desc "Migrate the database through scripts in db/migrate. Target specific version with VERSION=x"
# Use SQL instead of Active Record's schema dumper when creating the test database. This configuration value is commented out and indicates that if this is enabled then the schema dumps will be in SQL format rather than the more portable (and in my mind preferable) Ruby format. # adapters for, e.g., your development and test environments. So base.rb sets the schema_format variable to be ruby and therefore enables the automatic dumping of the schema after every migration. Update: I've figured out a way to disable schema.rb from being generated. I had a strange error recently to do with a bash script not running correctly. I couldn't see anything wrong with the file until I noticed that VIM was reporting that the file's type was DOS. And then use dos2unix and unix2dos to convert the file between the two different formats.